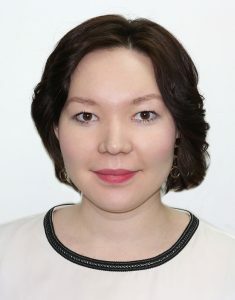 Sofya Omarova is a Marie Sklodowska Curie Fellow and PhD student in Political Science in the Department of Social Sciences at Oxford Brookes University. Her main research interests are related to the study of authoritarian regimes, including their political stability and the nation-building practices in Central Asia and the broader post-Soviet space. She received MA degree in International Affairs from the Graduate Institute of International and Development Studies (Geneva, Switzerland). Sofya has work experience in a number of international organizations, including the United Nations Population Fund (UNFPA), United Nations Commission for Europe (UNECE) and International Organization for Migration (IOM). Ms. Omarova is a recipient of multiple international fellowships, such as European Commission Marie Curie Sklodowska Horizon 2020 Innovative Training Networks Grant, Swiss Federal Excellency Scholarship, Nazarbayev Scholarship for Outstanding Academic Achievements. She is a member of Eurasian Nexus Forum, Swiss Society for Studies of Migration and OSCE Conflict Sensitivity Network.